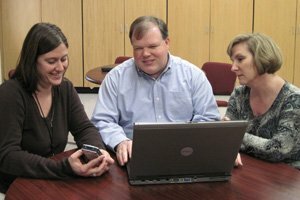 The SC School for the Deaf and the Blind works with local school districts to match children who are deaf or blind with the best educational options to meet their individual needs. We welcome the opportunity to share the many options available with you. In addition to the traditional campus enrollment in Spartanburg, the SC School for the Deaf and the Blind offers a variety of outreach services directly to the school districts on a contractual basis. Our goal is to ensure that each student receives the educational and accessibility services needed in the location that is most appropriate for the student. For example, the local school district may be able to provide everything a child who is blind needs academically, but may find that additional assistance with access technology, braille or mobility would be helpful. The same school district may find that short or long-term enrollment on the main campus in Spartanburg would be the best option for another child.